Everyone has a favorite type of project, be it cabled sweaters, ribbed hats, or colorwork mittens. My knitting taste runs to extremes: my two favorite kinds of projects are lace shawls and plain socks. I think this is because sometimes I want a more satisfying project that takes thought and focus, and other times I just want to knit, not spend time squinting at a chart. It’s like choosing a book to read. Sometimes I want the challenge of Tolstoy; other times I just want to reread Harry Potter. Both are great—it just depends on what you’re looking for at that moment. 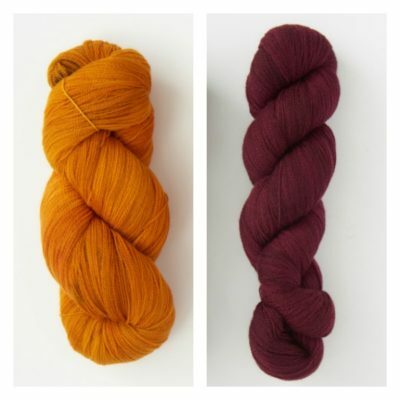 Knitting the beautiful Pierpoint Shawl includes the opportunity to work with this lovely yarn. I love the rhythmic, patterned nature of lace shawls. Following the chart and watching the pattern unfold is so satisfying. Then there’s the magic of blocking: your curly ramen lace opens up to reveal a stunning shawl. It’s such an accomplishment! The Pierpoint Shawl is a fantastic shawl for memorizing charts. The classic leafy lace pattern is worked repeatedly over the body section, so you learn the pattern quickly. It’s a generously sized shawl, perfect for draping over your shoulders while you read or for going out for a night at the theater. 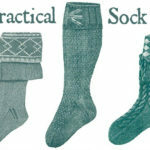 Simple socks, on the other hand, are so relaxing and require no thinking at all. You just knit endless rings, pausing only to work a heel. It’s a nice break from more complicated projects, and perfect for mindless knitting during a movie binge or when you just don’t have the brain space to keep track of shaping and complicated stitch patterns. Fancy self-striping yarn makes all the difference when it comes to socks: It elevates your socks from drab, ordinary footwear to a unique accessory. 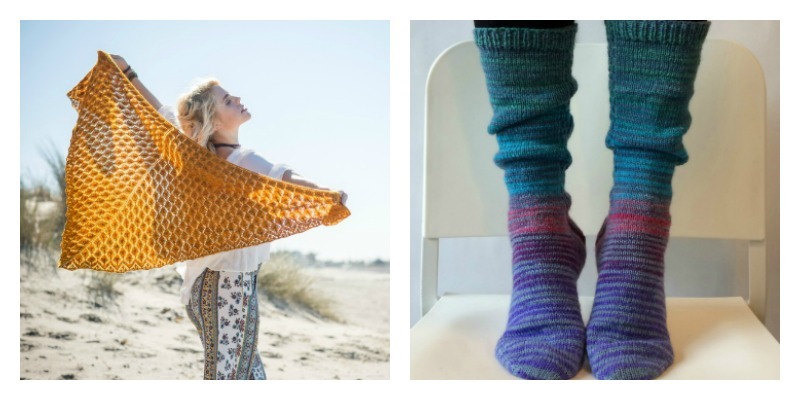 The Perfectly Portioned Toe-Up Gradient Sock Kit has everything you need to make fun and funky socks. Worked from the toe up in an exclusive self-striping gradient colorway, these socks are a fantastic way to show off your style. Both projects have their time and place, depending on what you’re in the mood for. If you’re looking for more meditative project, pick up a lace shawl. When you just want to knit, not think, work on a pair of simple socks. Choose a project that suits your frame of mind; no matter which one you decide on, you’ll end up with a delightful finished piece. ...or find a different project!